As no surprise rainbows are common in Ireland. Rain is frequent, and so are the weather changes back to sun again. 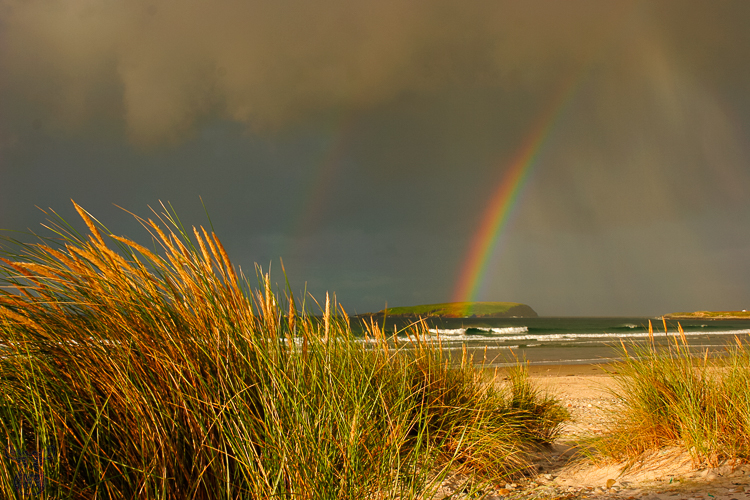 And often you find sun and rain combined, as here on Achill Island on the West Coast at the Atlantic Ocean. Pure conincidence, that I had to fulfil a very personal need early in the morning on our camping place in Keel, which revealed this pleasing view over the coastline. I am a dozy person hardly enjoying to stand up early - especially during vacation - but this look got me immediately back to our van to fetch my camera gear. I've got a notion it was worth the missed sleep.